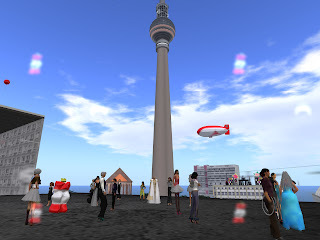 BERLIN in 3D, Virtual Worlds and Web 3D News: Virtual tourist group was cordially received by newBERLIN "mayor"
Virtual tourist group was cordially received by newBERLIN "mayor"
On Sunday May 17, Janita Collins and Esme Qunhua lead a tour of: Second Cities. Esme about the tour: "While much of the landscape of SL is decidedly not urban, there are cities. We will explore some replicas/homages to real life cities. Bring your walking shoes and your curiosity." They started their tour in our city and January Lightfoot, the "mayor" of newBERLIN, gave them a guided tour through the virtual Berlin. Esme after the tour: "Thank you so much. My group from ISTE loved your tour and meeting with January Lightfoot and his assistance Maike Hoorenbeek :-) Your use of Second Life was so different from anything we have come upon. It was quite exciting." Do you have 2.000 friends ? !